As for the Trade Textiles to the West, the Portuguese, then the Dutch, and lastly the English all came to the Indian shores primarily to participate in the flourishing trade, which at that time was the domain of the Arabs. They had no interest in the textiles, except as a commodity to be bartered. The textiles found in India were seen only a ‘means to an end’. In was only later that they came to be valued in their own right. The Portuguese established a trading port at Satgaon in Bengal in 1536. It was at Satgaon, north of modern Kolkota, that the earliest Indian textiles to be produced specifically for a western market were made. These are beautifully embroidered quilts, in a style something ‘humbler to the kantha embroidery which exists today.’ Embroideries of this kind were known in Portugal, when four ‘embroidered bed -spreads of Bengal are listed in an inventory of gifts given by the Portuguese king Henry to the Sultan of Morocco. (Barnes, etc. 2002) The Portuguese were expelled from Bengal by the Mughal forces in 1632, and the dominant role in Indian trade passed on to the Dutch and British. The Dutch had already monopolized the spice trade, so the English East India company began by buying India textiles to be re-exported for profit to the Middle east and northern Africa. Muslins were required in the Islamic countries for turbans and sashes. Then one enterprising Englishman had the far-sight to send some fine cottons painted textiles ‘back home’. By 1613, records show that the ‘pintadoes’ were selling in London. As trade increased, the company was actually sending designs to India, to be copied by the Indian painters. The coastal areas of southeast India were the key areas for painted and dyed cottons that dominated the Indian textile trade with Europe. The European market pieces or ‘Chintz’ had an unique and highly individual style, which bore very little resemblance to anything made in India for local consumption. If they appeared exotic to the English consumers, they were equally odd to the Indian craftsman who painted them. It speaks highly of the ingenuity of the Indian artist and craftsman to adapt to the demands of these various markets with complete ease and control. The overwhelming success of the Indian cloths in Europe was for two main reasons: colour and cotton. The Europe of the 17th century was clad entirely in wool and linen, and the appeal of cotton was unmistakable-it was light, comfortable, washable and cheap. The colours of the cloths were no less attractive. 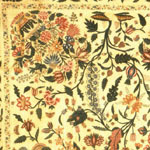 Indian chintz in Europe was first used as bed hangings, and later as wall hangings. The taste for Indian chintz furnishings reached its height in the late 17th century. The popularity for chintz as clothing had also become a rage, that it affected the local textile weavers in Britain. There was even an act of parliament passed to ban the import of Indian cloth, which did not help very much. No prohibition was applied in Holland, and we have more pieces surviving from there today.